Heat G Green (right) after a 3-pointer. 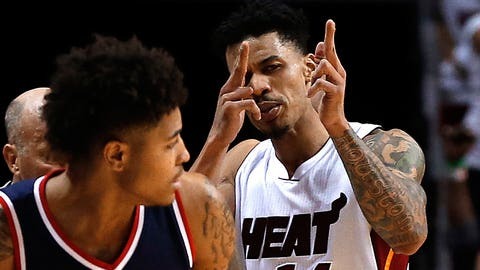 Miami Heat guard Gerald Green was fined $25,000 by the NBA on Friday for making menacing gestures in an exhibition game. The incidents occurred with 5:33 and 5:12 left in Miami’s 110-105 victory over Washington on Wednesday night. Green scored 28 points in the game.